Are you ready to get your Principals engaged with the Book Fair? You've come to the right place. I'm the principal at Bay Shore Middle School and an administrator for over 15 years. Check out these blogs for exciting tips from principals on how to get involved in the Book Fair. Increasing collaboration will ensure your Fair is a hit! Share your own ideas, too. 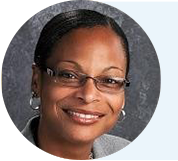 LaQuita shares a principal's perspective on nurturing students' reading habits. LaQuita shares how educators can encourage their colleagues to promote a reading culture at their schools. Laquita shares next steps on how to expand your classroom libraries. Grow your library by simply sharing one of your most loved books with an administrator. ​Principals of Passion. Yes, I Did Write Principals. Hear how your passion can have a contagious effect on students, teachers and the community. Read how just one action by a teacher or an administrator can change a child’s world. Edward shares his process on how to use our reading lives to “move the world” together. The next time your school holds a drive to help the less fortunate in your community, include a book donation too.